Prison Terminal: The Last Days of Jack Hall is the fourth film Julia Reichert has worked on that has been nominated for an Oscar. Wright State filmmaker Julia Reichert is once again involved in a film nominated for an Academy Award. Reichert served as associate producer on Prison Terminal: The Last Days of Private Jack Hall, which is nominated for Best Documentary Short Subject. Directed by Illinois filmmaker Edgar Barens, the documentary tells the story of the final months in the life of a terminally ill inmate and the prisoners who provide hospice care for him. It premiers on HBO on March 31. Reichert’s role in Prison Terminal included mentoring Barens, providing feedback on the film and connecting him to people at HBO. “My job was to encourage him, look at rough cuts, try to help with funding, try to find an editor,” she said. This is the fourth film Reichert has worked on that has been nominated for an Oscar. The Last Truck: Closing of a GM Plant, which Reichert produced with her partner Steven Bognar, who currently teaches film at Wright State, was nominated for Best Documentary Short in 2010. 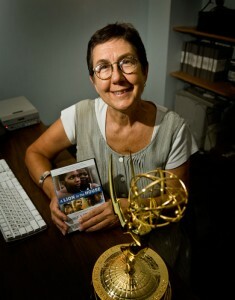 Her films Union Maids and Seeing Red were nominated for Academy Awards for Best Feature Documentary. Reichert’s 1971 documentary Growing Up Female was added to the National Film Registry by the Library of Congress in 2012. In recent years, Reichert and Bognar have produced a string of highly acclaimed documentaries, including A Lion in the House, which won a Primetime Emmy, and Sparkle, which was the Audience Award winner at the 2012 SilverDocs Film Festival, among others. Reichert and Bognar were considering beginning a film project about hospice care in prisons when in 2007 they learned about Barens’ work. Barens had just spent six months filming in an Iowa state penitentiary. Reichert, who has been called “a godmother of the American independent film movement,” recently left the ranks of Wright State motion pictures faculty to return to full-time filmmaking.